I tried flammkuchen for the first time in Freiburg, Germany, at the edge of the Black Forest, in the dead of winter. We were fleeing the city for the weekend, my friend Hillary and I. 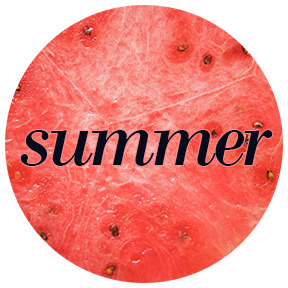 (No one tells you this, but Paris is dreadfully dreary in the winter, and sometimes in the spring, summer, and fall, too.) We rented a car, and drove a squiggly line eastward across France, pausing in Reims just long enough to see the grand cathedral, its two towers lit from below like some magisterial jack-o’-lantern. Hours later, on the outskirts of Strasbourg, it started to snow. We’d made two decisions to save money: rent the cheapest car possible (a manual, which obligated Hillary to drive the whole distance) and take small highways, instead of the national road. The former allowed us to bypass toll fees; however, it also meant we relinquished certain amenities like wide lanes, and the illumination of highway lamps. 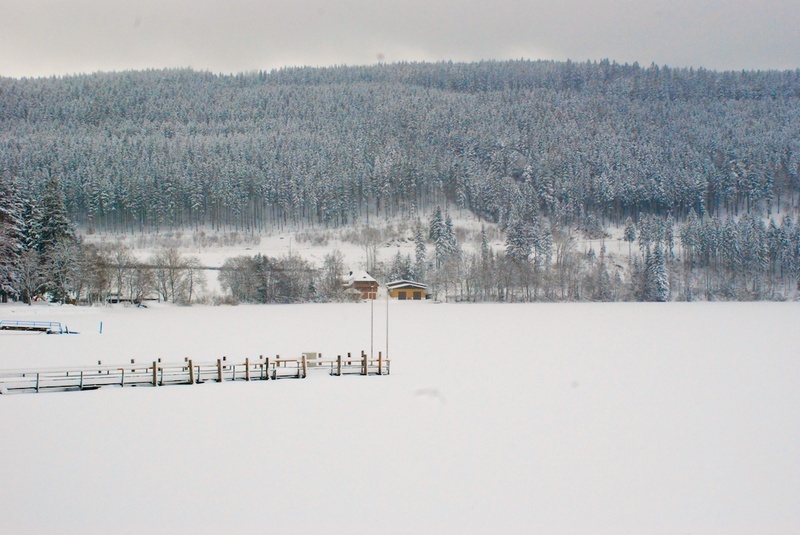 By the time we crossed into Germany, our single lane road was dark and slick with fast-falling snow. Wind rattled the bones of our small car, and the only light shone blearily through snow-hampered headlights. We slowed to a crawl. A trip that was meant to take six hours quickly lengthened considerably. 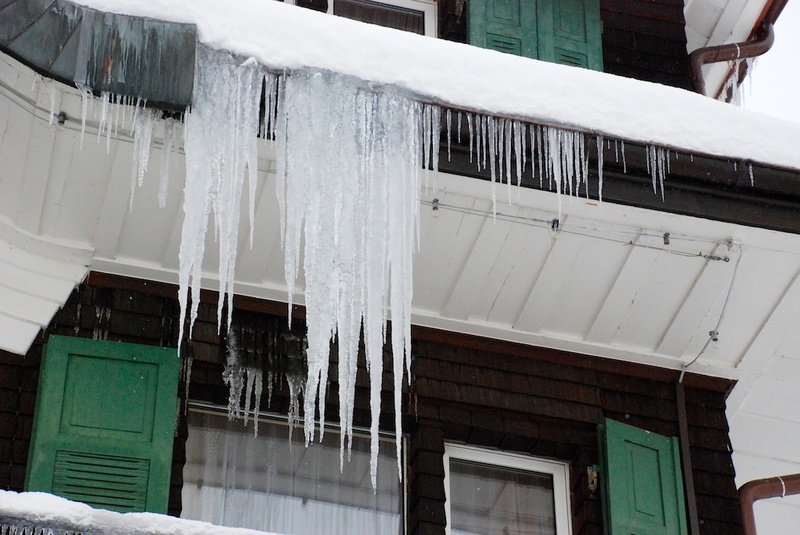 When we finally arrived in Freiburg, car-weary and restless, the snow had abated. We found a parking spot outside a friend’s apartment, where we planned to stay the weekend. 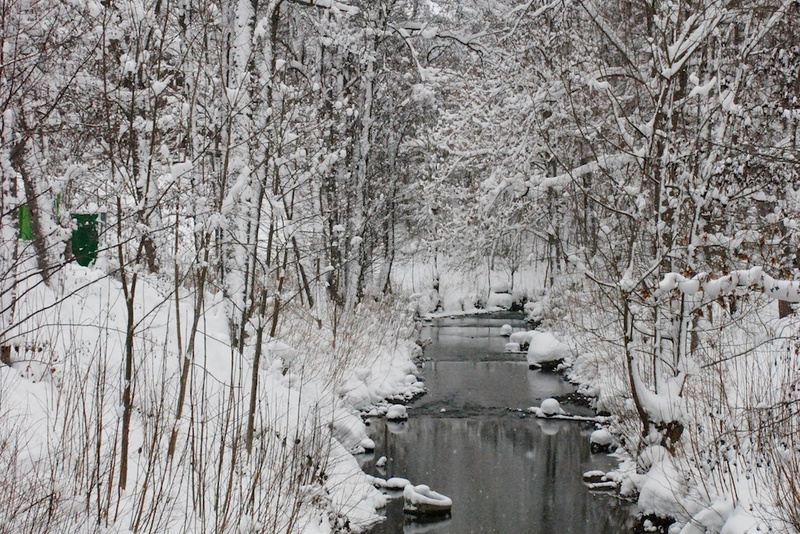 The trees, the houses and road were so heavily laden with snow that it lit an otherwise starless night. The clacking of our car doors interrupted the otherwise empty, peaceful and absolutely quiet street. After depositing our bags on Liam’s floor, we struck out for a walk around Freiburg. Crossing the wide bridge toward the heart of the city, a swath of buttery light hoisted across the dark ribbon of the Dreisam, we meandered along cobbled streets. We passed buildings that resembled gingerbread houses, or set pieces from a Grimm fairy tale. Liam was accustomed to showing visitors around his adopted city, and he pointed out the silliest gargoyles hanging off the Gothic cathedral. In the market square, we traced the circular etchings that still marked the size of bread in the 13th century. Soon we decamped to a bar to drink Paulaner beers from tall glasses the length of my forearm. Our appetites whet, we moved on to a cavernous restaurant, where dark wooden beams drew semicircles across the ceiling. It seemed as if all of Freiburg University had turned out for beer and flammkuchen, and to celebrate the end of the week. I, meanwhile, had never even heard of flammkuchen. Liam translated our options off large parchment menus: there were so many variations of flammkuchen to choose from. In the end, I selected the classic version, and it arrived at the table on a wooden board: crisp, creamy, and piping hot. The bacon was smoky, salty, and crunchy against the concentrated sour creaminess of crème fraîche. 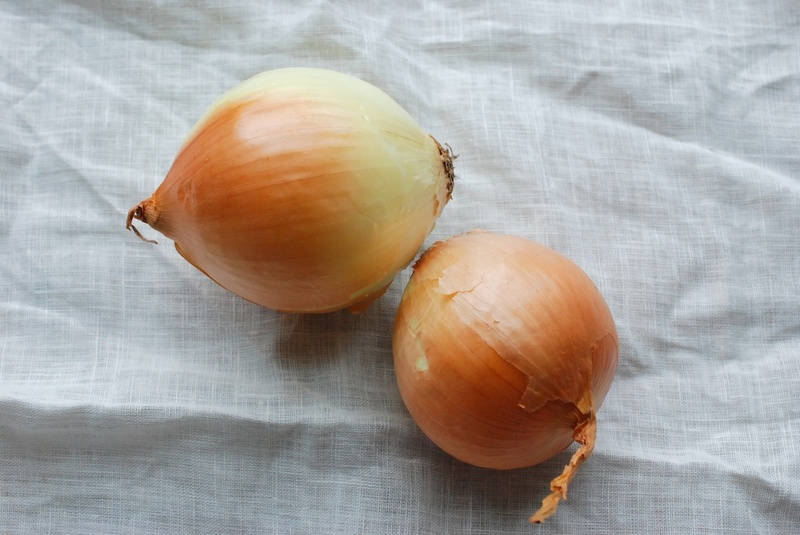 Sweet, rich onions were deepened by a suggestion of nutmeg. Flammkuchen turned out to be the perfect antidote to our long and snowy car journey; the ultimate nostrum for a cold night. Although, so many steins of good German beer certainly didn’t hurt. 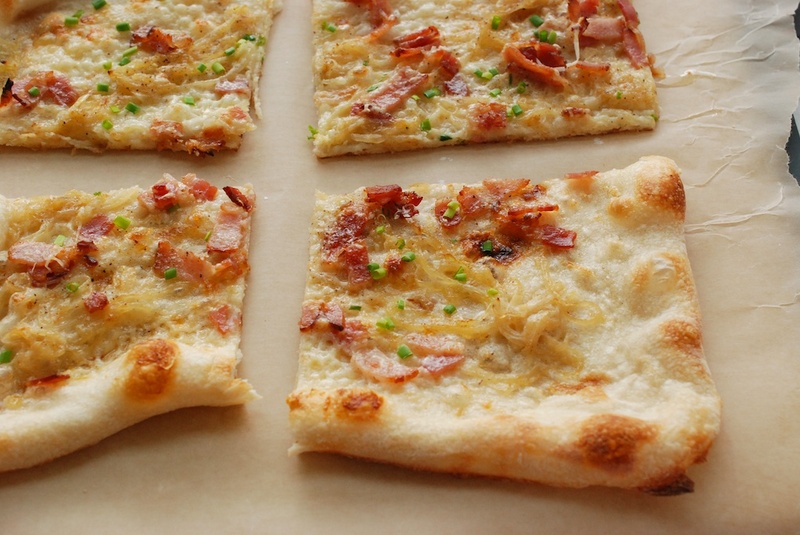 A note on what flammkuchen actually is: Flammkuchen, or tarte flambée in French, comes from the Alsace* region of France. 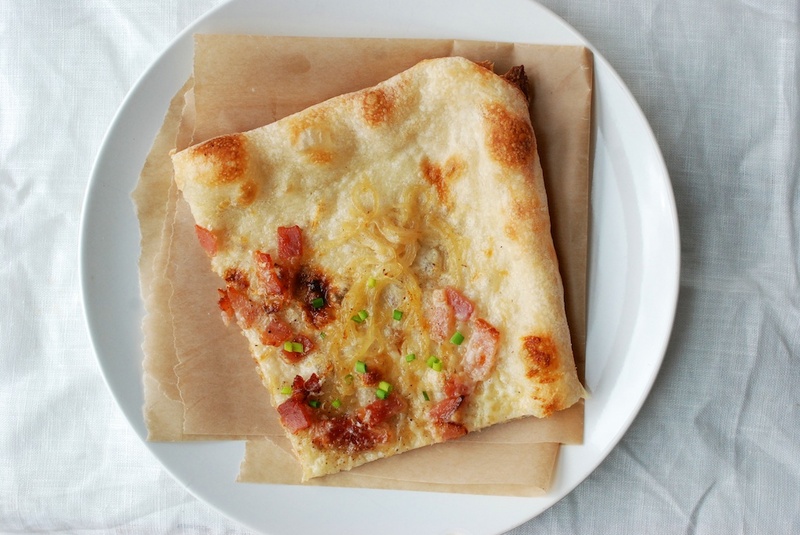 Simply, it’s a (rectangular**) flatbread cooked in a wood-burning oven. (The name literally means “flaming pie/tart/cake”.) 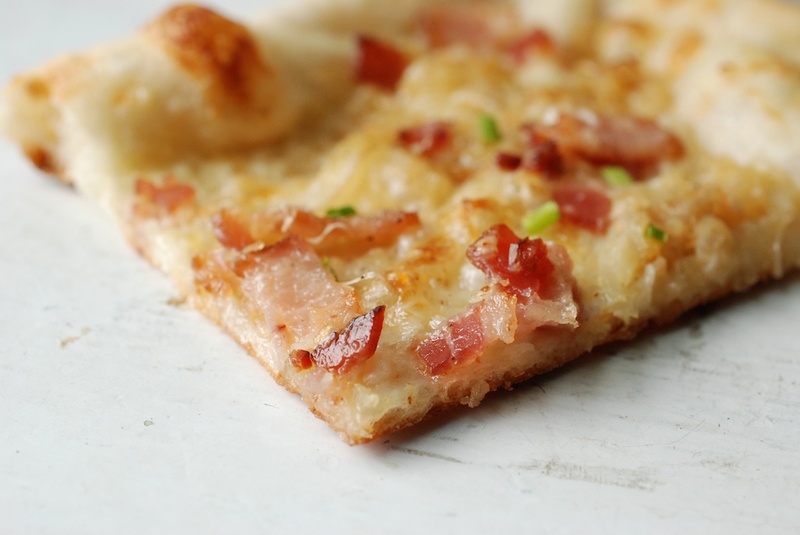 The story goes, country folk used flammkuchen to test the heat of their wood-burning ovens: If your flammkuchen caught fire or immediately burned to a crisp, the oven was still too hot to bake bread. Of course, wood-burning ovens are quite hot even at ideal temperatures, so if you have yourself a wood-burning oven: 1) the flammkuchen will cook up, bubbly hot, in a quick 1-2 minutes. 2) expect a slightly charred outer crust 3) can I come over? 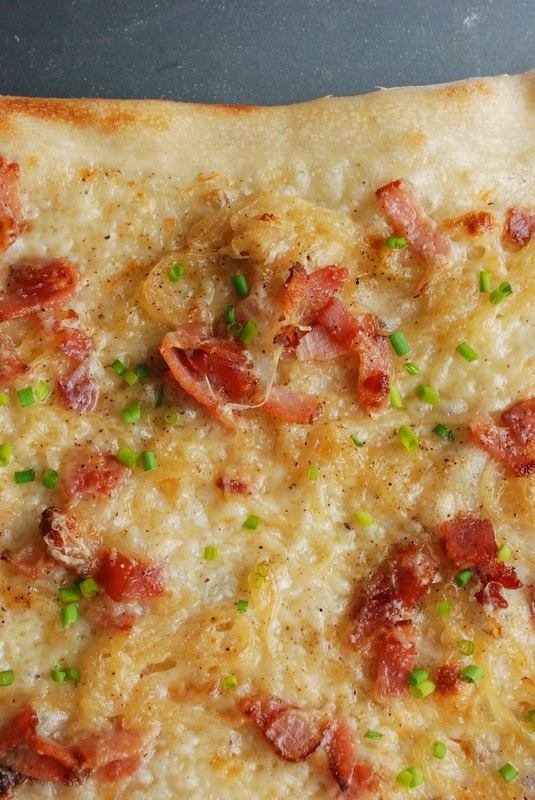 Classic flammkuchen toppings include: crème fraîche, fromage blanc/quark, white onions, and lardons (smoked bacon is traditional). Nutmeg and black pepper are not unwelcome. 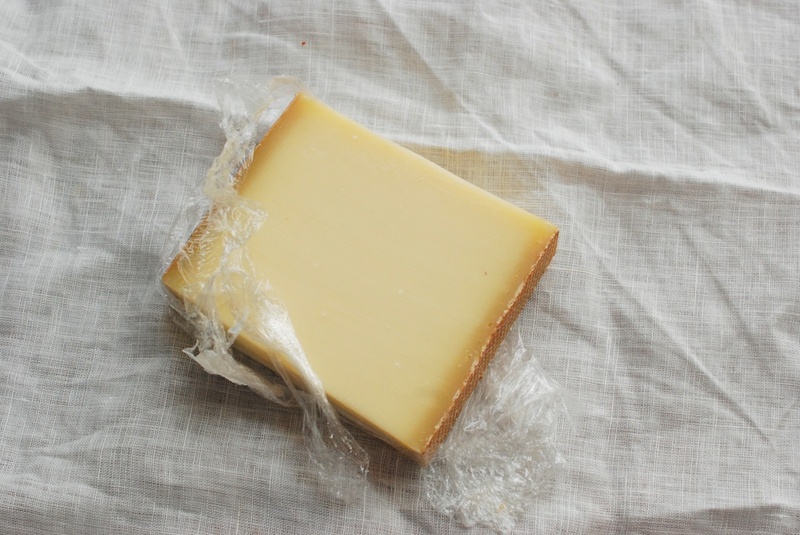 Classic derivations include: gruyère or comté cheese, and mushrooms. 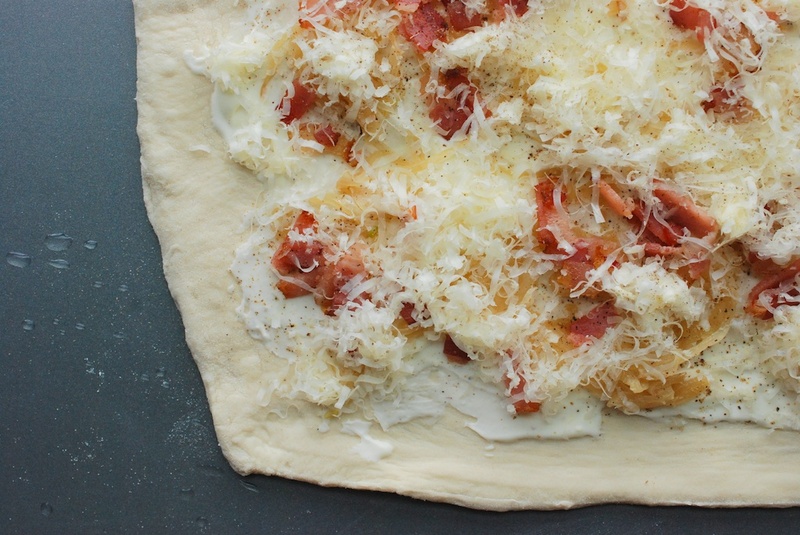 Tradition aside, as with pizza, it’s really up to you to be as creative as you like. The cheese/vegetable/meat/herb combinations are nearly endless. Many establishments make dessert versions too, with apples, plums, spices, fruit brandies, and the like. *I should mention that, while Alsace is technically French, the region has historically oscillated between French and German control. Thusly, it’s a bit of a cultural mélange. 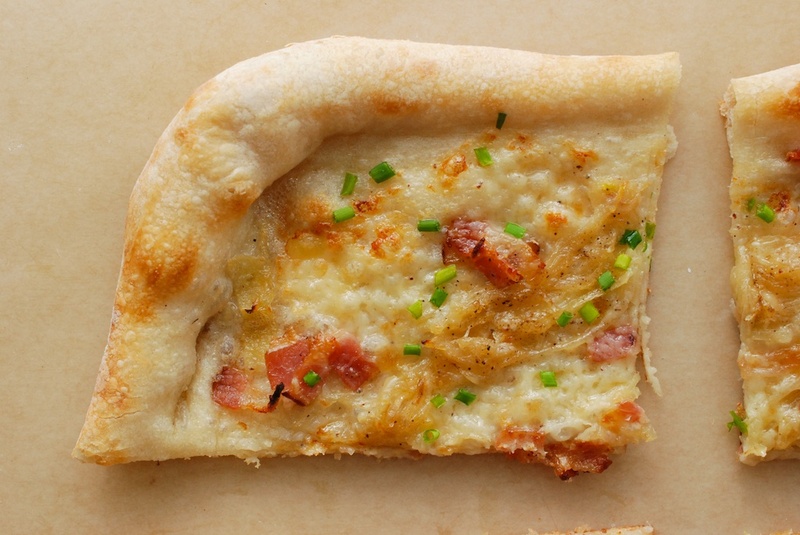 **I would be lying if I told you my pizza/flammkuchen ever turn out in uniform shapes. It matters not: even amoeba-shaped flammkuchen taste delicious. A note on the dough: Real flammkuchen employs bread dough, rolled very thin. (After all, it was meant as a tester before the ‘real’ bread went into the oven.) However, my (lazy, easy, fast) answer is to stop by my local napoletana pizza place and pick up dough from them. (Ultimate laziness, I sometimes ask them to spin it out for me too.) I’m not above using naan, or even a wheat flour tortilla, from the supermarket though. A thick slice of good bread, cooked under the broiler, would make an equally tasty vehicle. A note on the crème fraîche: It’s not too hard to find these days. Crème fraîche is thick, creamy, sour, lovely. Please do not use non-fat sour cream, or some other such horror; it’s too runny, and won’t provide the kind of concentrated flavor you’re looking for. 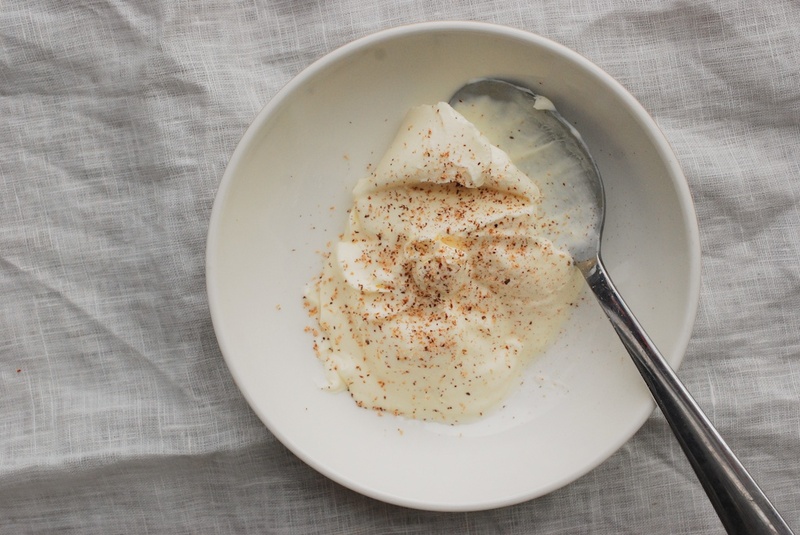 You can experiment with fromage blanc, quark, or even goat cheese if you like. Thick Greek yogurt might work too. 2. Stack up your bacon, and cut it into lardons (or little matchsticks). Heat a wide pan (cast iron, if you’ve got one) over medium heat. When it’s warm, add the bacon. Cook the lardons until they are half-way to crispy, about 5 minutes. 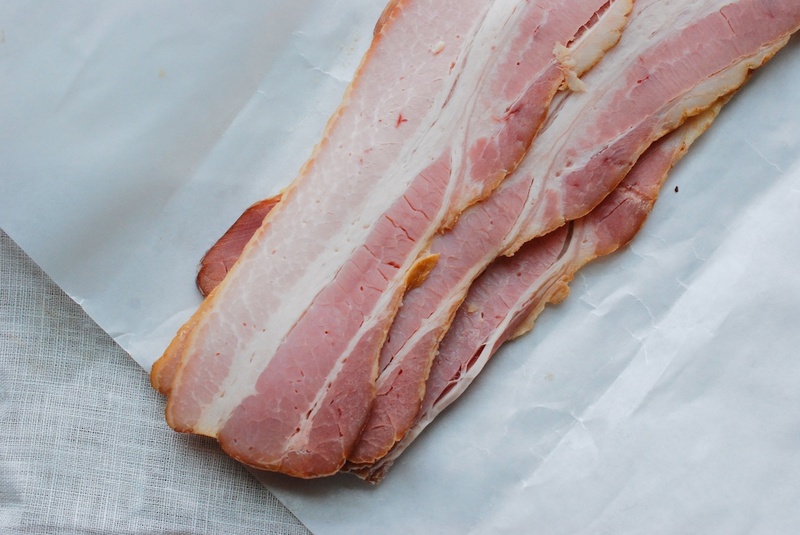 (The bacon will cook more in the oven, so don’t overdo it on the stovetop.) 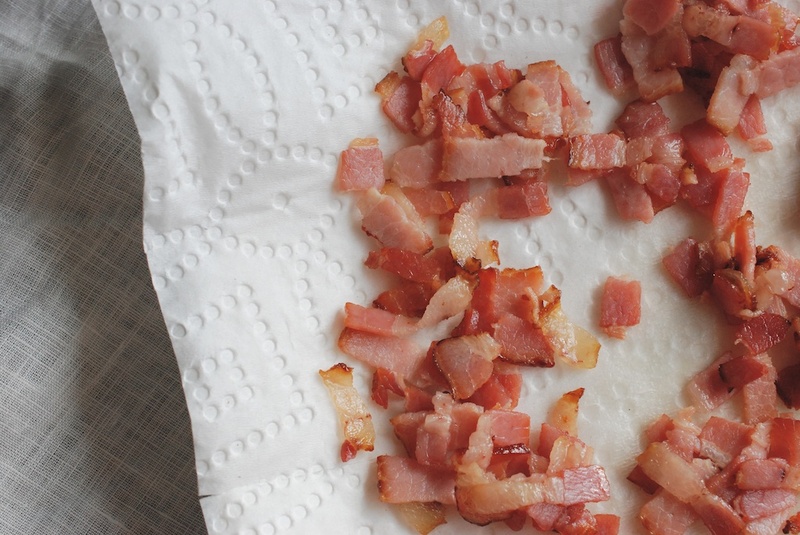 Move the bacon to a paper towel-lined plate to drain. 3. Meanwhile, slice up the onions quite thinly. Once the bacon is out of the pan, you can add the onions to it; the bacon fat will serve as a lovely lubricant. Cook the onions until lightly golden, 10-15 minutes. Stir in a pinch of salt. 6. Take a baking sheet, and flip it upside down. Flour the surface generously. (Trust me, this step will allow you to slide the flammkuchen into the oven easily.) 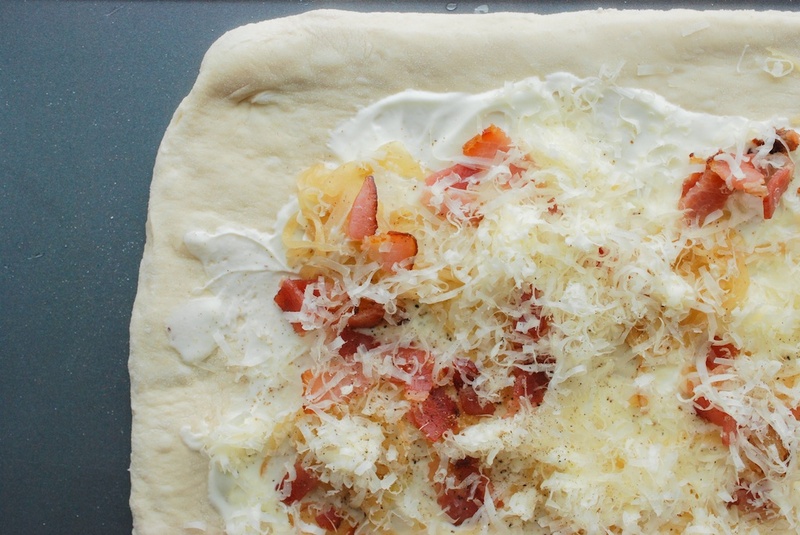 Spread the pizza dough on top of the upturned baking sheet, and then add the toppings in this order: crème fraîche, onions, bacon, gruyère. Top with black pepper. Move the flammkuchen to the oven by carefully transferring it to the heated pizza stone/first baking sheet. (Aim for the back of the pizza stone/baking sheet.) If you are new to pizza/flammkuchen-making, I think this video is really helpful. 7. 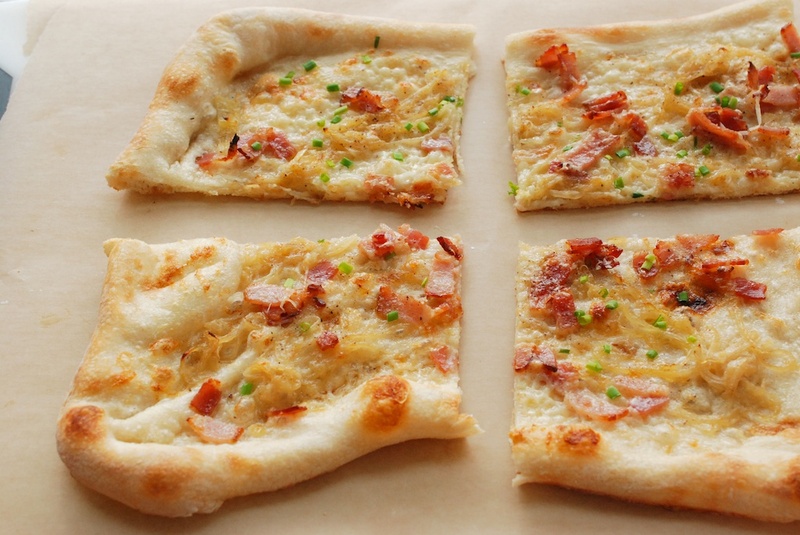 Cook the flammkuchen for 3-5 minutes, or until it’s bubbling and the crust is just past golden brown. Remove it from the oven (I use tongs to pull it onto a cutting board; the dough doesn’t stick once it’s cooked). Scatter the minced chives all over. You’re flammKILLINGME with how good this recipe looks. Also, can we go to Germany now? where can you buy the tray in the US so that you can cook it on your grill? You can buy pizza stones at most cooking supply stores, or online. However, if you are grilling pizza, you can do that right on the grill. Just make sure to oil the grates, so that your pizza doesn’t stick! Wow and Thanks, I too had flammkuchen for the first time in Germany and was supremely happy to find a recipe. I’ve had so much fun trying to cook the dishes we tried while we were vacationing there. Wonderful recipe. Like everyone else. I first tasted Flammkuchen while visiting with our German friends in Frankfort. They took us to a beautiful winery and after the tour we sat in the garden and enjoyed a glass of white wine and ate this wonderful thing call Flammkuchen. I saw your recipe and hoped it would be a close replication of what I remembered eating. Dead on. So good. Thanks for your note, Kevin. I hope you enjoy!